Using specially designed Pilkington Planar™ fittings, single toughened, insulated or laminated glass panels are fastened back to the support structure. These highly engineered and tested bolts are countersunk into the glass to allow a flush exterior surface. 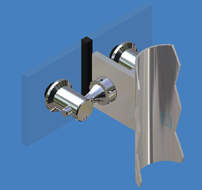 Loads incident on the glass are transferred through the Pilkington Planar™ fittings and springplates into the structure.